Heaven is smiling brightly down on your little angel. When she wears this gorgeous 100% solid 14k gold bracelet, everyone will see that same heavenly light shining within her. Exquisitely designed with flawless Swarovski® crystals crowned with lustrous gold beads, this bracelet becomes a gift of ethereal elegance befitting only a princess like yours. 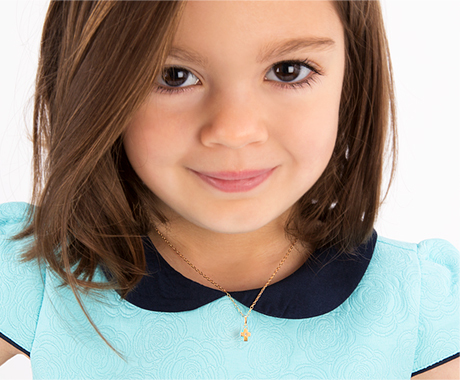 Personalized with her masterfully engraved name, initial, or monogram, she will know how precious she really is. Beautifully hand made by skilled designers using only genuine high-end components, this luxurious bracelet is of the highest quality. Enjoy gorgeous gift wrapping, complimentary with all Tiny Blessings bracelets.